The health benefits of drumming are increasingly being researched and documented. 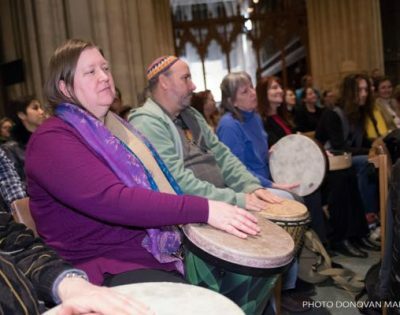 Drumming is being used in a wide variety of health care settings to help people with cancer, Parkinson’s, Dementia, Alzheimers, ADD, addiction, depression and trauma. And it is an excellent tool for supporting wellness in individuals and communities. Every human being has a heart beating like a drum. The pulse of life comes from each heart beat. When our rhythms are in sync, we feel better about ourselves. When our rhythms align to positive energy, we are uplifted. When our rhythms are given expression, our creativity awakens. As rhythmic beings, we know rhythm inside and out. Our essential nature vibrates to the unique tune of our own body. When we are in harmony with ourselves, we have good health. When we are in harmony with others, we have healthy communities. Harmony is accessible and achievable! By setting the intention, creating the space, issuing the invitation, and welcoming everyone to PLAY DRUMS, an energy is unleashed. Suddenly individuals feel part of something bigger and are empowered to express themselves – tapping in to their own rhythm and tuning in to the harmony of the group. The ripples that go out from intentional community drumming and music making, like pebbles in a pond, go on and on and intersect with one another, creating new ripples and rhythms and vibrations, carrying their sonic thumbprint of harmony and wellness wherever they go. Tuning in, tuning up and staying in tune changes our lives for the better. Tuning in is to listen, tuning up is to engage and staying in tune is to practice wellness for the mind, body and spirit. Rhythm is our internal gage for harmony. Drumming is the tool. Let us discover and maintain our wellness rhythms through individual and group music making and let the ripples we create bring joy to the world one beat, one rhythm, one harmonic convergence at a time.